What a beautiful ceremony this was! It was short and sweet. 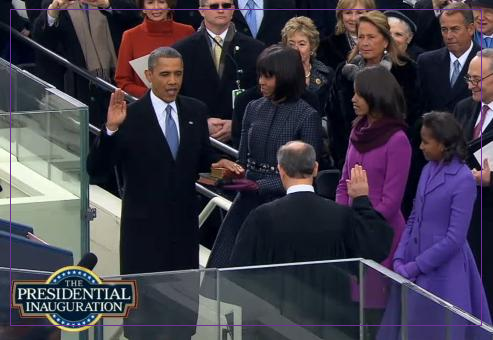 President Obama, along with his family were the center of attention today as he was sworn in for another ride as the leader of the free world. It was the cutest thing to see his gorgeous wife and beautiful girls there having a ball as well. The President was calm and seemed a little more at ease this time around. He delivered a solid speech that pointed out exactly what he hopes to bring to the country this go round. He was very clear on gay rights which is a first for a President on this stage, and made sure to make the connection between the history of African Americans in this country and his incredible current circumstances. I loved this ceremony. If you missed his speech you can hear it below.